After the introduction of programmable sound generator integrated circuits (ICs) in the 8-bit video game hardware of the 1980s, the industry quickly moved on to more sophisticated sound generation methods such as frequency modulation (FM) synthesis and CD-quality audio file playback. Nevertheless, if once largely forgotten, the last decade has seen a significant and sustained revival of interest in the early video game sound technologies, and the rise of a vibrant ‘chiptunes’ community intent on exploring their distinctive musical possibilities. 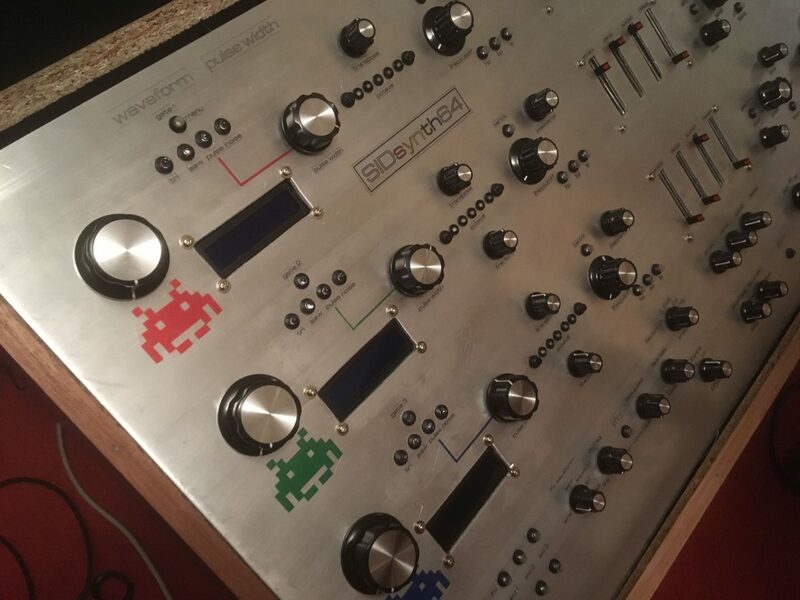 Developed by Rob Hassell between May 2017 and May 2018 as part of the BA (Hons) Music Technology programme at the University of Wolverhampton, SIDsynth is a multi-voice chiptunes synthesizer based around the use of obsolete MOS Technology 6581/8580 Sound Interface Device (SID) chips; a specialised IC originally found in the Commodore 64 computer. Despite the age of the SID chip, the SIDsynth draws heavily on contemporary developments and could arguably not have existed until relatively recently. Online marketplaces enable increasingly scarce and revered second-hand ICs to be sourced from individual sellers worldwide. Dedicated enthusiasts have made crucial but previously rarely accessible technical documentation freely available in online repositories such as SIDmusic and archive6502. Additionally, by using open source and low-cost Arduino microcontrollers to interface otherwise disparate elements (three SID ICs, contemporary computer hardware and a physical user interface), the project has been able to benefit from the Arduino platform’s extensive documentation and community expertise. A musical demonstration will explore how the SIDsynth goes beyond the capabilities and functionality of prior SID chip implementations (including those imagined by the designer of the IC) through the addition of polyphony (i.e. multiple simultaneous voices), enhanced sound synthesis capabilities, and extended user controls that emphasise real-time playability. Rob Hassell is a composer, sound designer and music technologist. He has been employed by Bell-Fruit Games since 1997, having full responsibility for all aspects of music and sound production for a diverse range of games. More recently, Rob established a music production business and small record label and has enjoyed modest success in the development of local artists. He has also been a consultant for education authorities on a range of projects including music production and music technology support. From 2013-18 Rob studied Music Technology at the University of Wolverhampton, graduating with first class honours and receiving the Dean’s prize for highest classification in the Faculty of Arts as well as the Richer Sounds prize for highest classification in Music Technology. This work by Rob Hassell, Mat Dalgleish is licensed under a Creative Commons Attribution 4.0 International License.